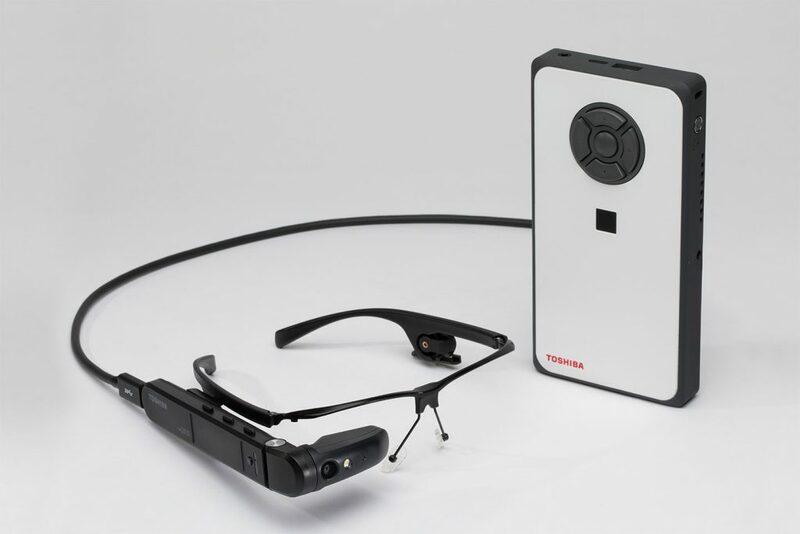 Toshiba’s Client Solutions Division (CSD) a division of Toshiba America Information Systems, Inc., today announced the first completely wearable Augmented Reality (AR) solution to combine the power of a Windows 10 Pro PC with the robust feature set of industrial-grade smart glasses. Designed for enterprise customers, Toshiba’s new dynaEdgeTM AR Smart Glasses packages together the company’s new dynaEdge AR100 Head Mounted Display (HMD) with its dynaEdge DE-100 Mobile Mini PC for a completely wearable PC system maximizing mobility, productivity and security without compromising flexibility. To complete the dynaEdge AR Smart Glasses solution, Toshiba will offer customers two software options-Toshiba Vision DE Suite and Atheer AiRTM Enterprise. Toshiba Vision DE Suite is the software engine designed to realize the essential functionality of Toshiba’s innovative AR solution. For fast and easy navigation, device functions are grouped into three color-coded menu categories: Communications, File Viewer and Tools. From these three menus users can take photos, record and stream live video, save and retrieve documents, access diagrams, receive text messages and communicate through live video calls. This easy-to-use approach to navigating a robust solution elevates productivity and improves efficiency. In addition to a full suite of on-device services, the software offers IT manager and organizations with advanced synchronization and centralized device management capabilities. Toshiba Vision DE Suite reimagines productivity and efficiency for enterprises.